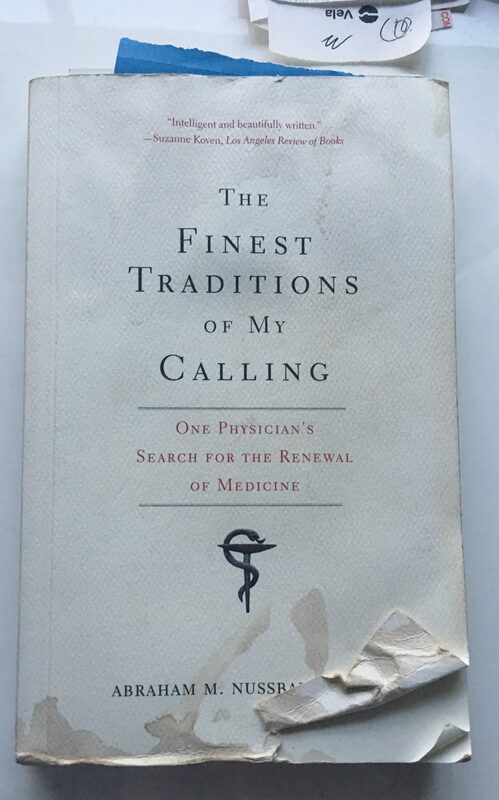 This is Therese’s battered copy of The Finest Traditions of My Calling: One Physician’s Search for the Renewal of Medicine, a memoir about practicing medicine during healthcare reform, which is transforming the relationships between patients and physicians. Therese dog-eared passages about how reformers want to transform the delivery of medical care using processes pioneered in high-risk industries like flying planes and assembling automobiles. They want hospitals to run like factories maximized for efficiency and effectiveness. Factories make things; people are formed through habits we learn together. Despite our efforts at automating care and billing electronically, medicine remains a set of skills you practice over years of training until they become habits which orient your life towards the care of ill people. Out of medical school for just 12 years, Dr. Abraham M. Nussbaum has joined the ranks of physicians who write their memoirs even as they are paying off their student loans. These young people write to complain, to explain, to reflect, to crack jokes. A few feel destined for new and better careers in literature. None in recent memory has wielded a set of intellectual and writerly tools to such dazzling and instructive effect as Dr. Nussbaum . . . He writes beautifully, in a lucid prose as notable for its process as its conclusions: The reader can actually watch him think. . . . we will eagerly await the next volume in the set. …intelligent and beautifully written… Like a master clinician taking a thorough medical history, Nussbaum, a psychiatrist in Denver and an assistant professor at the University of Colorado School of Medicine, probes the early years of his own training as well as the origins of American medicine in an attempt to sort out what’s gone wrong. Occasionally someone speaks up in the midst of our clamoring arguments about social problems and manages to do the simple and extraordinary thing that makes all the difference: they ask the right questions. Reading The Finest Traditions of My Calling, I couldn’t help but see Nussbaum as a Martin Luther of health care and this book is his 95 theses. May true reform ensue. In a time when hospitals threaten to become factories and doctors seem no more than factory farmers, Nussbaum helps us see that there is an alternative. That alternative turns out to be exemplified in the stories he wonderfully tells of what he has learned from the sick. Hopefully his book will be widely read because it has important practical as well as theoretical implications. An eye-opening journey into the rapidly industrializing world of modern healthcare. Nussbaum steadfastly reminds us that true ‘quality’ needs to include the humanity of the patient and the caregiver. A compelling read. …a wonderful book. It is at times deeply moving, at times delightfully funny, always insightful, and deliciously subversive of the elite medical establishment that believes it can reform medicine by passing laws, tweaking policy, manipulating behavior, or offering courses in medical humanism. He joins the ranks of Atul Gawande and Abraham Verghese as a superlative-physician commentator on the state of twenty-first century medicine, and he is probably the best diagnostician of the three. A must-read for physicians, medical ethicists, policy makers, and anyone concerned with what it means to be a physician today. In The Finest Traditions, the psychiatrist Abraham Nussbaum searches for what it means to be a true physician. By turns passionate, smart, funny, horrified, and disconsolate, Nussbaum takes you into the embattled world of contemporary medicine where patients and doctors still, somehow, mostly triumph. His generous narrative offers clarity and direction on how the industry can avoid sacrificing humanity to the trappings of an industrialized, unsympathetic, automated version of health care. A revealing and stirring directive aiming to heal medicine from the inside out. Abraham Nussbaum offers a plea to see that true reform of the health care system will be possible only if we also seek a renewal of the physician’s practice. With compelling narratives from his own experience as a psychiatrist, Nussbaum’s entreaty is easy to believe. … It is easy to delight in this text. Nussbaum’s narrative approach is full of heart. His critiques of the health care system and the formation of physicians are thoughtful, balanced and often deeply moving. It is not hard to imagine that this text will stand alongside the works of Atul Gawande and Abraham Verghese for its ability to draw fellow physicians and lay readers into the unresolved problems of modern health care. Nussbaum describes current campaigns for evidence-based treatments, checklists, quality-improvement guidelines, and reduced hours for residents as misguided efforts to apply industrial standards to medicine. These efforts aim to improve outcomes (i.e., increase patients’ chances of survival, reduce mishaps) at the expense of care. Nussbaum maintains that medicine differs from all other industries, and that the way a doctor cares for a patient matters more than the outcome.